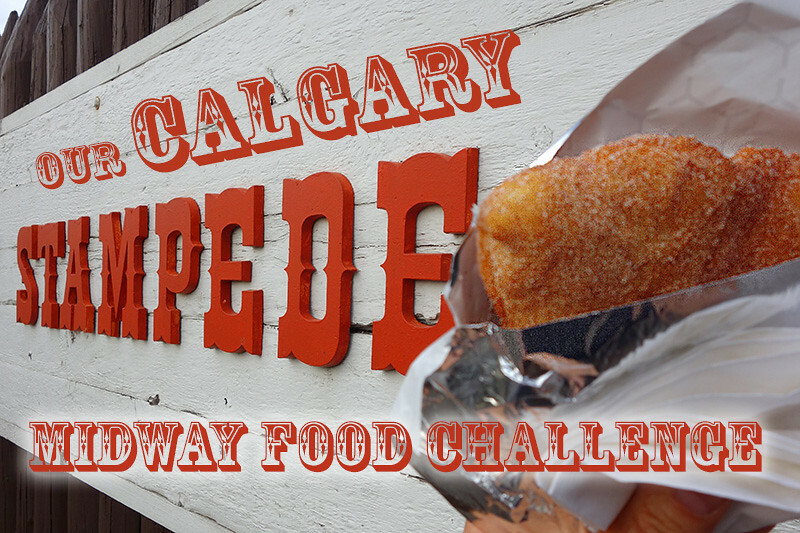 There are 32 new foods to try and many old favorites at this year’s Calgary Stampede. We tried as many as our stomachs could handle in one day and here are our results. 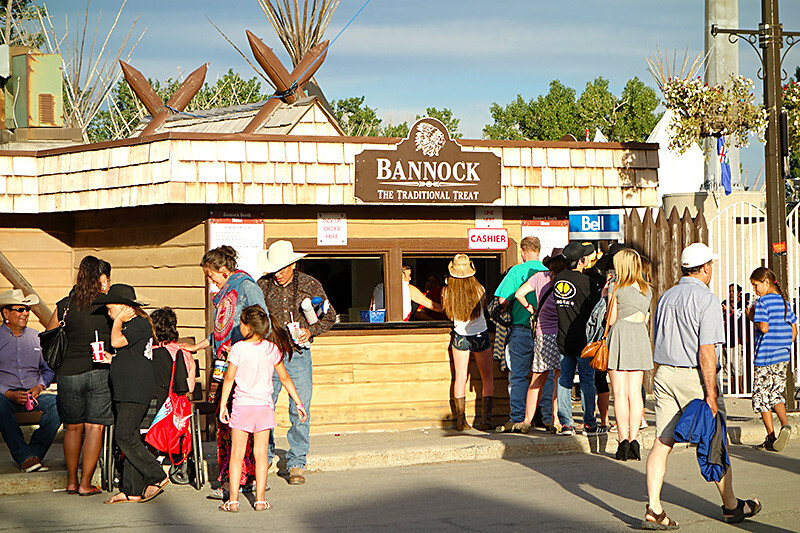 Our favourite food from this year’s midway is the Moose Ears found at the Bannock booth at the entrance to the Indian Village (near the south entrance to the grounds). This is not one of the new 32 items but it’s new to us so we put it on our list. This was actually one of the last items we tried but we still really liked them. Moose Ears are simply fried bread with cinnamon and sugar. Served up hot and fresh, these taste more like something out of grandma’s kitchen than your usual midway food. They are also large enough to share. $5 each. 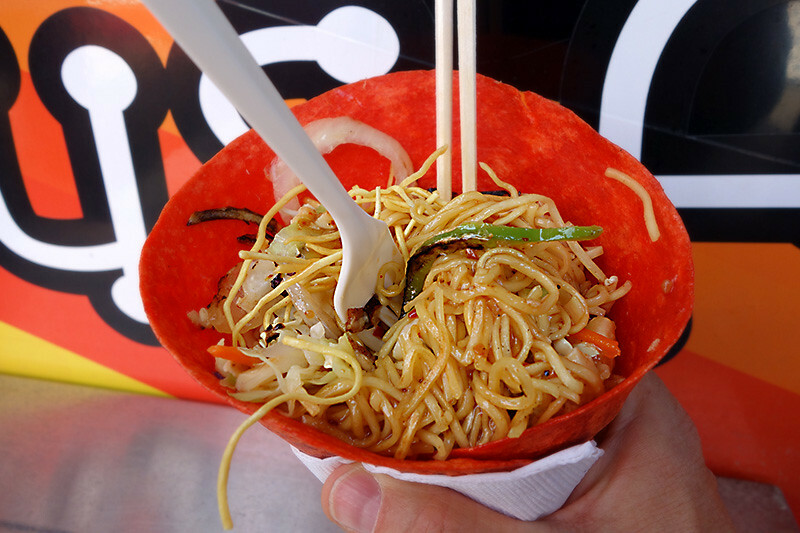 The Thai Noodle Wrap at Wrap Daddy’s is the official 2014 best food on the Calgary Stampede midway, so we had to give it a try. It’s pretty tasty although ours didn’t have much chicken, but it was still filling. The sauce is on the sweet side with a bit of a spicy kick. In the context of Stampede food, this is almost healthy. $10 each. We have enjoyed Naaco Truck in the past so wanted to give their new Papri Tot a try. 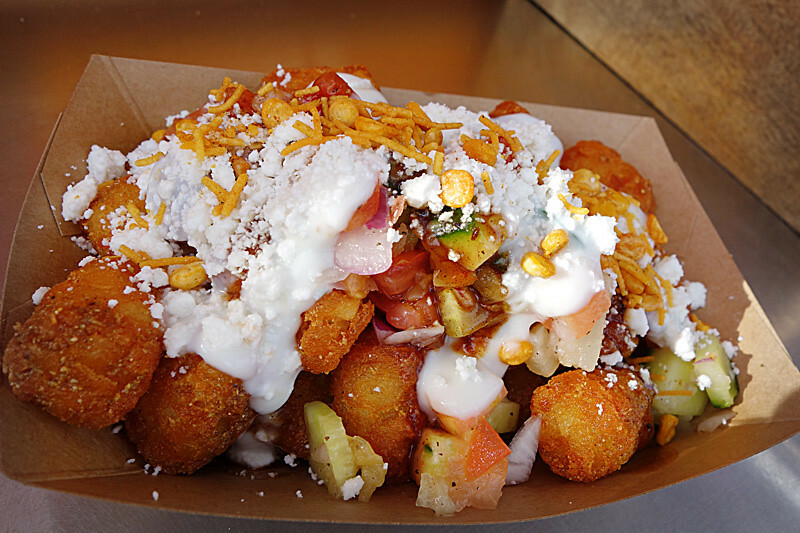 The Papri Tot is tater tots topped with pico, dates, tamarind chutney and sweet yoghurt. We thought it beat out the Thai Noodle Wrap for taste and originality, but lost a bit because of the fried tater tots. $10 per order. 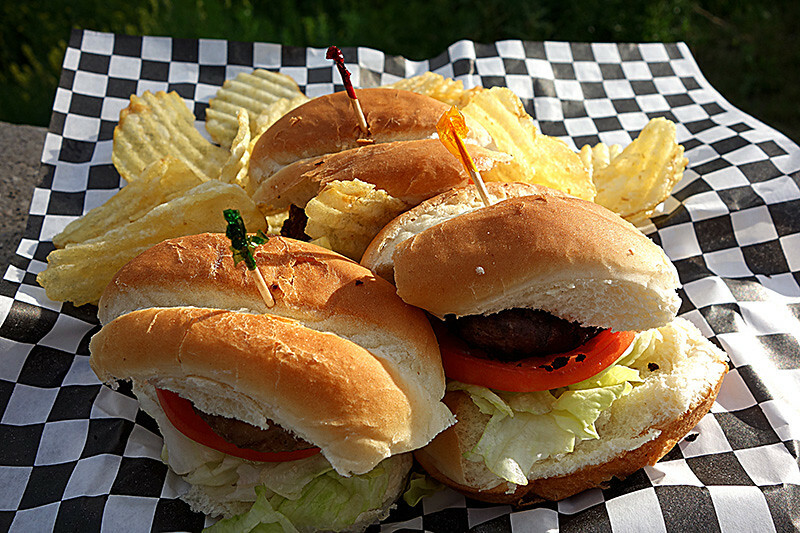 Crocodile, Ostrich and Kangaroo sliders. As adventurous as that may sound, the croc tastes a lot like chicken, and the ostrich and kangaroo were a lot like beef burgers. The excitement in these burgers is less in the flavour and more in the “hey this is croc!” $12 for three sliders with a side of chips. 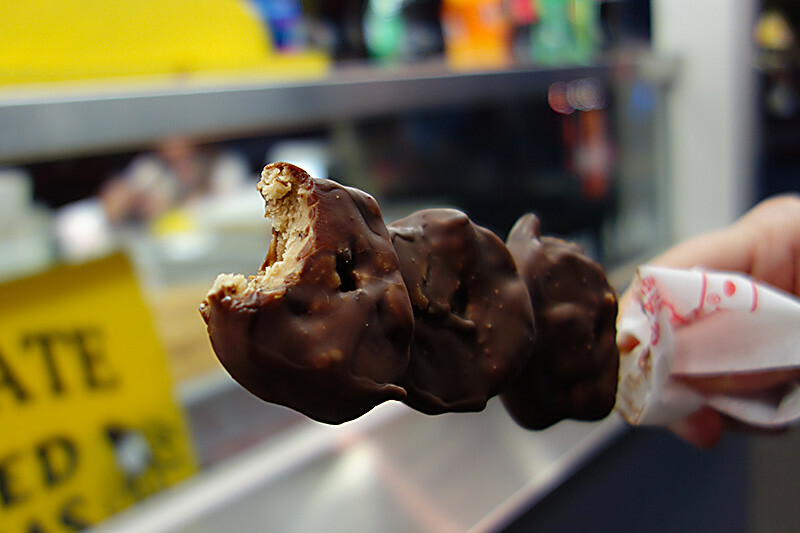 Chocolate Dipped Cookie Dough – On a Stick! This is pretty good if you are a lover of cookie dough. You get a stick of four cookie-sized pieces of dough, dipped in chocolate, and nuts too if you like. Pretty sweet so better shared. $7 per stick of four. Red velvet mini doughnuts – I was looking forward to this new twist on an old favourite. These really just tasted sweet and nothing more. I would stick to the original cinnamon and sugar variety, or better yet, head over to the Indian Village for the Moose Ears. $6 per stick of donuts. Some new foods we didn’t have a chance to try include Turkey Dinner Poutine, Scorpion Pizza, and Deep Fried Peanut Butter Cups. 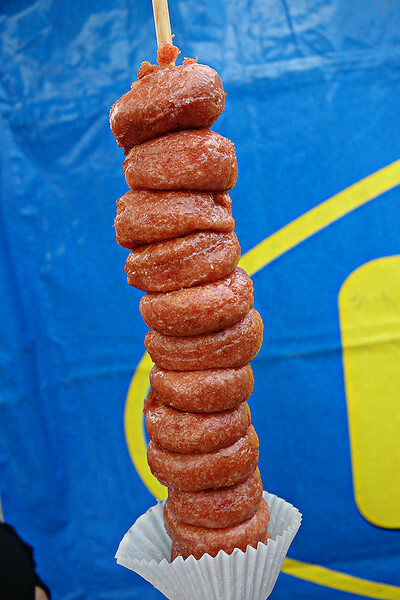 What are your favorite Stampede midway foods? Howdy!! All this looks very tasty. Thanks for your opinion on the new Stampede foods. I will definitely try to the Moose Ears. They were my favorite! Hope you enjoy them!